Research conducted recently by the Unisys Corporation reveals that identity theft when it comes to credit card scams is Americans’ number one issue. Can identity theft be scarier than terrorism? When people ask me, “How do I protect myself from credit card scams?” I tell them, “Cancel your card, or never use it.” Because this is the only way, or make investments in identity theft protection or buy identity theft devices to keep your things always in check. Fraud alerts or credit freezes can help prevent new account frauds. Protect your computer with McAfee, or any other Internet security software. Personal security (when it comes to violence) and national security have been an issue. On the other hand, this new research reveals that people are more worried about fraudulence, and the potential risk of having their financial savings drained by con artists. That’s not too hard to believe, considering the number of data breaches, as well as the Madoffs of the world fleecing naive investor. 5% of American citizens believe that this economic collapse has increased the risks of being victimized by cyber criminals and thieves. The majority are also worried about their “private” details on a bank, or corporate network may be jeopardized. 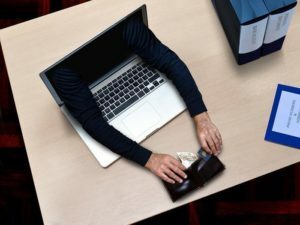 FBI’s Internet Crime Complaint Center’s Annual Report confirmed that online scams increased by 40.1% in 2019. US Dollar reductions resulting from online scams increased to $265 million. On the whole, most of these issues are valid, due to problems in the system of issuing credit that aid new accounts fraud. On top of that, bank account takeover requires only access to bank card numbers, available in hacked data sources or vulnerable any time you hand your card over to any gas station worker. Skimming has become the financial sector’s fastest-growing violations, according to the U.S. Secret Service. The global ATM Market Association reports over $1 billion in global losses from credit card scams and electronic transgression associated with automatic teller machines. As the cardholder is usually only responsible for the very first $50.00 in losses, which is usually waived by a “zero liability policy,” credit card holders who do not focus on their statements usually let these charges eat them. On the other hand, due to the particular nature of any credit card transaction, when the data leaves the credit card, it is accessible. No matter what credit card security may have been gone. Check your banking and credit statements very carefully. Review every single charge and oppose any illegal charges within 30-60 days. Call your credit or bank card provider immediately if you notice any deceitful activity. In the UK, the Home Office approximated the cost of identity fraud (known as identity theft in most other countries) as roughly 3.3 billion dollars over the last 3 years. People of the United Kingdom can request a duplicate copy of their credit file from the 3 major credit reporting agencies of Equifax, Experian, and Callcredit to keep track of their credit history. However, in the United Kingdom people who discover they’ve been subjects of identity theft should first try to resolve the questioned credit through the financing company, and then, if failed, report that they challenge particular information on their credit history. The Australian Centre for Policing Research reports the costs of id theft to the people to be at $3 billion every year. 25 % reported frauds in Australia involve assuming a false id. A report of birth certificates revealed that 13% of the sample led to false or erroneous information. A very common approach to acquiring information to create a new identity in Australia is actually the use of “identity kits,” easy to purchase of such high quality that it’s easy to fool people. Banking institutions report that a loss of revenue of around 25 million dollars has taken place as a result of identity theft. In 2017 it was determined that around two million Australians have had their private information stolen and used fraudulently. In Canada, identity theft has become the fastest growing criminal offenses. The credit firms of Equifax and TransUnion report 1900 Canadians file complaints every month. Other typical forms of identity theft in Canada include the acquiring and use of Social Security Numbers (Social Insurance or Security benefits). The Canadian federal government said that there’re approximately 3.4 million more social insurance numbers than there are actual Canadians. In Malaysia, Hong Kong, and Singapore, a lot of lenders, companies, and the federal government have placed more restrictive security measures on the particular release and use of financial and personal information, and people still seem threatened by id theft. In all these countries, the most frequent form this criminal offense takes is the abuse of credit/debit card theft. Next, generally most thefts results from scams that occur as a result of internet shopping and bill paying. The most common information gathering tool in most of these countries is the use of spyware and Trojans, with an approximated 20% of people affected by these systems. Now you know!